In Germany, UFOP reports that the scarcity of supply of agricultural feedstock due to drought-related declines in yield had little impact on consumer prices. The main factors driving prices up were labor or energy costs. In the 2018 crop report for Germany, the German Minister of Agriculture, Ms Julia Klöckner, put the rapeseed harvest at 3.65 million tonnes (2017: 4.27 million tonnes). This was the lowest tonnage in more than 18 years. Below-average yields regularly raise the question as to whether bread prices will rise or consumers will have to fork out more for rapeseed cooking oil or processed products such as margarine. However, disappointing harvest figures, which also have a negative financial impact on producers, are only of limited use for drawing conclusions on the development of consumer prices. According to information published by Agrarmarkt Informations-Gesellschaft (mbH) (AMI), consumer prices for rapeseed oil have remained virtually unchanged over the past four years at on average EUR 0.99 per litre. 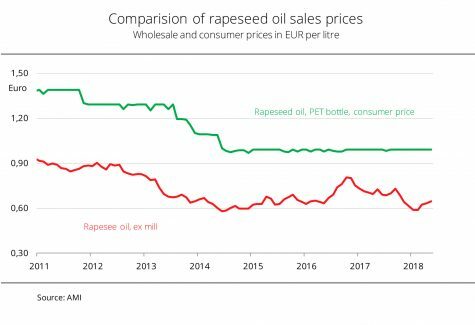 By contrast, wholesale prices for rapeseed oil ex oil mill have fluctuated much more strongly without repercussions on prices at the consumer level.